With countless fans who are celebrities, make-up artists and beauty editors, our award-winning Strawberry Rhubarb Dermafoliant has quickly become a cult classic. If this coveted exfoliant is already part of your beauty arsenal, our new Stone Crop Oxygenating Fizzofoliant™ will take your skin care routine to the next level. But don’t swap out your beloved Strawberry Rhubarb Dermafoliant just yet. Here’s why this classic favorite and popular newcomer are better together. The particles in the Stone Crop Oxygenating Fizzofoliant™ are finer, giving them the ability to zero in on hard to reach spots and reveal a clean and refreshed complexion.If you’re after the smoothing action of a physical exfoliant, the Strawberry Rhubarb Dermafoliant is probably one of your go-to products. The particles in this best seller gently slough dead cells from the skin’s surface, for a perfectly buffed complexion. The particles in the Stone Crop Oxygenating Fizzofoliant™ are finer, giving them the ability to zero in on hard to reach spots and reveal a clean and refreshed complexion. Adding water to the Strawberry Rhubarb Dermafoliant creates a creamy paste that gently exfoliates to smooth your skin’s texture. The Stone Crop Oxygenating Fizzofoliant is a powder-to-foam product that generates a light, fizzing action to release oxygen onto your skin’s surface, invigorating your complexion and bringing it back to life. The Strawberry Rhubarb Dermafoliant cares for the surface of your skin, sloughing away dead cells and buffing its texture for a smooth, flawless looking finish.The Strawberry Rhubarb Dermafoliant cares for the surface of your skin, sloughing away dead cells and buffing its texture for a smooth, flawless looking finish. 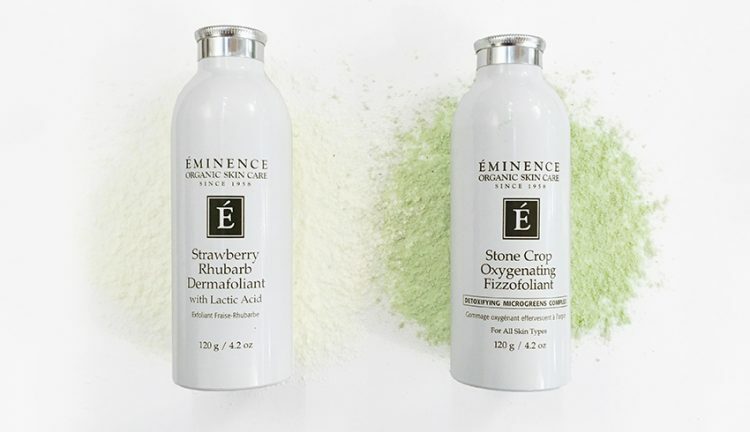 The Stone Crop Oxygenating Fizzofoliant™ is your anti pollution solution – it de-gunks clogged pores by softening impurities that have accumulated throughout the day and harnesses the power of potent microgreens to protect against the aging effects of environmental stressors. 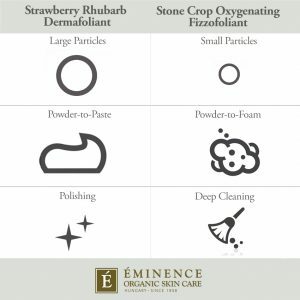 To experience the benefits of both exfoliants, we recommend using the Strawberry Rhubarb Dermafoliant in the morning to smooth and prep your skin and the Stone Crop Oxygenating Fizzofoliant™ at night to remove dirt and grime that collects during the day.